Ron Abuelo 7 Años is a rum produced at the very bridge between North and South America: Panama. This particular brand of rums is produced by Varela Hermanos, makers of numerous Panamanian sugar cane spirits – including a sugar cane-based gin! The Ron Abuelo line of products consists of 3 rums, the Abuelo, the 7 Años, and the newly launched 12 Años. Varela Hermanos has been involved with sugar cane since 1908, when the company’s founder, Don Jose Varela Blanco, opened a sugar mill in the town of Pese. As I’ve said before, where there is sugar cane, rum will soon follow, and in 1936 Varela Hermanos S.A. began fermenting and distilling pressed cane juice into rum. The 7 Años rum is an interesting blend of rum-making traditions. During the Panamanian Dry Season (from December through April), freshly-pressed sugar cane juice is fermented and then distilled before being placed in used oak Bourbon barrels for aging. During the wetter months Varela uses a combination of pressed cane juice and molasses for its fermentation base. After seven years in the barrels, the rum is blended and then bottled to be enjoyed. Ron Abuelo 7 Años is a very lovely light gold color in the glass. Held up to the light, the rum takes on the same color as fresh honey. The legs on the glass appear thin and sharp, but cling strongly to the glass and only grudgingly retreat into the bowl. The nose of the 7 Años is dry at first, with hints of flowers and straw. This light, dry nose gives way to heavier, richer notes of vanilla and caramel. It’s a wonderful blend of what one would expect from both molasses-based and cane-juice-based rums. At first taste, Ron Abuelo 7 Años is sweet at the tip of the tongue with warm flavors of toffee and caramel. The mid-palate introduces floral notes of vanilla that give way to apple blossom just before the finish. Ron Abuelo finishes with earthy notes of leather and almost no burn in the throat. The texture is rich and full on the tongue. Ron Abuelo 7 Años’ flavor profile is incredibly different from another excellent Central American rum, Ron Zacapa 23. The Abuelo has a similar richness, but with notes more evocative of an excellent brandy at the mid-palate. This spirit begs to be made into a Rum Old Fashioned. I was feeling saucy though, and pulled out my copy of Ted Haigh’s excellent Vintage Spirits and Forgotten Cocktails to find something different. Shake in an iced cocktail shaker and strain into a goblet. Garnish with a fancy lemon twist. This was too interesting of a cocktail to pass up – especially when I noticed Ted’s note to try using agave syrup in place of the simple (I suffer from an infatuation with agave syrup). 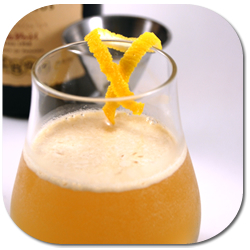 The drink is sweet and tart, with the rum, cognac, and curacao all revealing themselves in a wonderful harmony. Ron Abuelo 7 Años is a testament to the adage that age statements do not make a great rum – great craftsmanship does. While other rums are older and made in more exotic fashions, this rum is a perfect companion for any tippler. Enjoyed on its own from a snifter or in a cocktail, Ron Abuelo 7 Años will not disappoint. No wonder this rum won a gold medal in the 2009 Ministry of Rum Tasting Competition. For $20US, this is a value that is very hard to beat. To be completely honest, I wasn’t really blown away by the 12. I remain very impressed by the 7 though. It’s an utterly fantastic rum, and may find its way into a few Palmettos tonight. Excellent information on the development of this rum. I’ve reviewed the 12, and found it lacking, but am eagerly anticipating receiving the 7 años now. Great review. I live in Panama and this my rum of choice. The caramel and vanilla tastes are very prevalent but not so much to turn you away. I actually drink it straight on the rocks, but let it the ice melt a bit into the rum. Tastes excellent. This is the best Rum I have ever tasted and I am not a rum drinker. This Rum is smooth and gentle to the throat; what a wonderful drink on ice. My daughter brought a bottle back from Panama and I have not been able to find another bottle in South Carolinia. I just received a bottle of the 7 and can’t wait to taste it. 100% recomendation. Where i could get a bottle of this rum in south Texas, those anybody know? My rum of choice… you can’t go wrong ever! Smooth and no hang over…exCELLent! Great review!!! I enjoyed the 7 myself, but was at a loss of putting description to the flavor profile. The nose burned warm in my nostrils (perhaps I sniffed to strongly), but I felt that I caught strong notes of toffee and the bourbon cask, itself. I did not capture any essence of straw, but I did catch a faint floral overtone on the front end. The note of vanilla was very pronounced…and completely intoxicating! Now, I did catch a straw..in fact, rye essence upon the first touch to the front palette, quickly followed by warm caramel and vanilla and other spice flavors. Am I crazy, or was there an overtone of orange rind in the profile of this rum as well? Nonetheless, despite the semantics regarding the nuances of the flavors within this rum, your assessment and review was perfect!